Ida Brown's obituary and death certificate both say she was born in Lansing, [Ingham Co.,] MI; however, we should consider these two records as one datum because the informant for both was probably the same person. As the 1850 and 1860 censuses put her parents in Barry Co., MI, and her father, Ira Brown, states in his pension application that he lived in Hastings, [Barry Co.,] MI, with no mention of ever having lived in Lansing, I have stuck with Hastings as her birthplace. Keep in mind that children are far more likely to be mistaken about their own birthplace than their parents and that informants for death certificates and obituaries are notoriously unreliable about the birthplace of the deceased. An enlargement of this photo shows three people on the porch, two men and a woman, but their faces are too indistinct to identify. 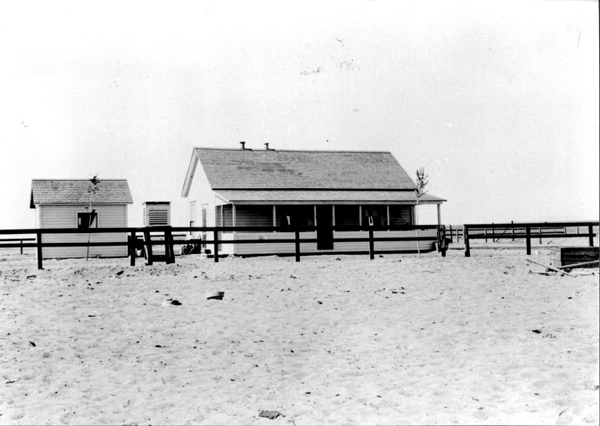 Source: Photo courtesy of the Churchill County Museum & Archives, Fallon, NV. 1. Interview of my mother, Nina Gale (Straub) Matthiesen, daughter of Nina (Willis) Straub. 2. Livingston County, Missouri, Marriage License Records and Index, Vol. 2, (LDS Film #0965985), p. 275: Marriage Certificate of William Willis & Ida Brown. Wallace BROWN is Ida's brother; their parents were born in NY, not OH. This film may rank as the most difficult film I've ever tried to read. The daughter has to be Nina, but try as I might, it does look more like "Minor," than "Nina." Listed two households from William's brother, Levi WILLIS, who is listed five households from their widowed father, John R. WILLIS. 4a. 1890 Census: the 1890 census population schedules were destroyed. 4b. Veterans' Schedules: U.S. Selected States, 1890 (Broderbund CD-131): not found, but there are no MO records on CD. Both of Ida's parents were born in NY. Nina was either separated or divorced, not widowed. Lucy Emma was born in 1898, not 1899. Ida had five surviving children and at least eight total. Both of Ida's parents were born in NY. Both of Ida's parents were born in NY. Ida obviously didn't know where her parents were born; yet, she was dancing around the truth. Both of Ida's parents were born in NY, then lived for a time in Ohio before moving to Michigan, then Missouri, so Ida obviously had these locations kicking about in her memory. 9. Nevada State Board of Health, Bureau of Vital Statistics. Filed 3 Feb 1912. Standard Certificate of Death: William Murphy Willis. State Index No. 585; Local Registered No. 11. 10. Obituary of William Murphy WILLIS from the Churchill County Eagle, 10 Feb 1912. 11. Nevada State Department of Health, Division of Vital Statistics. Filed 27 Nov 1943. Standard Certificate of Death: Ida Willis. State File No. 1431; Registrar's No. 72. Gives Ida's birthplace as Lansing, MI. 12. Obituary of Ida (BROWN) WILLIS from the Fallon Eagle, 27 Nov 1943. Gives Ida's birthplace as Lansing, MI. Ira B. Brown, formerly sexton at the city cemetery, died at his home in Kansas City, Sunday afternoon, after a lingering illness, from old age and as complication of diseases. Interment in Chillicothe Tuesday morning at 10 o'clock. Funeral services from the home of Wm. Willis, corner Third and Walnut streets. Which means our subjects moved from Chillicothe to Lincoln Co., MO, some time between 18 May 1889 and 12 Jun 1900. Miss Canna Willis Dead Miss Nellie Canna Willis, daughter of William and Ida Willis, died at the home of her parents near St. Louis, Wednesday at 10:05, of lung trouble. Miss Willis was a niece of Mrs. Cy Kirk's and granddaughter to the late I.B. Brown. The remains were brought to Chillicothe Thursday, and the funeral took place at 4 o'clock from the home of Mr. and Mrs. Cy Kirk, north Cherry Street, Rev. F.W. Allen conducting the services. Interment was made in the City Cemetery.